As the French Tennis Federation takes a wrecking ball to Court Philippe Chatrier, starting this morning, it feels as if Rafael Nadal has outlasted the building that made him a star. As he showed in yesterday's final, Nadal remains indestructible, even when cramp turns his racket hand into an agonising claw. The scoreline of Nadal's 6-4, 6-3, 6-2 victory over Dominic Thiem - which delivered a scarcely-believable 1th French Open - might suggest that this match grew easier as it went on. Yet Nadal needed all his resilience when his left hand locked up early in the third set. In an unusual breach of protocol, Nadal walked to his chair after missing a first serve at 2-1, 30-love. He ripped off the tape around his wrist and the trainer rushed on to manipulate the hand, the fingers of which were pointing in various directions like a broken umbrella. "It was a cramping on the (middle) finger but it was not a normal cramping,"
Nadal explained afterwards. "Probably because I had the bandage here (around his wrist), creates pressure that doesn't allow the right circulation. It was quick in that moment, and it was scary, because I was not in control of my finger. I just went straight to my chair and tried to cut the tape." After a three-minute delay, Nadal marched back to his mark and completed the second half of a double-fault. Yet while Nadal's body language would change completely for the remaining 25 minutes - his normal competitive frown relaxing into a blank, almost haunted stare - he refused to back down. Thiem became confused about how best to exploit the situation. His game plan had been to hit high to Nadal's backhand, then open up his body and skew the next shot at an acute angle into the opposite corner of the court. But as soon as Nadal started downing salt tablets and undergoing hand and forearm massages at each change of ends, Thiem switched tactics and looked to extend the rallies in the hope of wearing his opponent out further. Understandable as it was, this decision only served to make him more passive. Nadal took advantage, choosing his moments to attack. 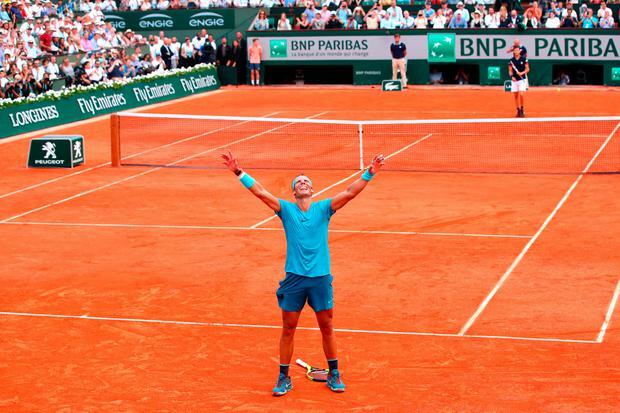 He only dropped one more game as he completed his 86th win at Roland Garros in 2hr 42min. That span would have been shorter, had he not pushed the allotted time between points well past the official limit of 25 seconds, reaching around 40 whenever Thiem put him under pressure on his own serve. He was handed one time-violation warning but never docked a first serve. Nadal needed five match points in a tense final game, eventually completing the job when Thiem fired a backhand long. He dropped his racket, turned towards his box and lifted his arms in what looked like relief as much as exultation. Later, as the Spanish anthem played, he sobbed long and hard. This is not a reaction we are used to seeing from him but it revealed just how much he had invested in this clay-court season, both physically and emotionally. The victory means that Nadal now has 17 major titles, leaving him just three short of Roger Federer. Even more astonishingly, these two pillars of the old firm have now shared the past six majors equally between them. Is Nadal upset to still be trailing Federer by three slams, despite his phenomenal feats over the past year? He turned philosopher when the question was raised. "You can't be frustrated always if somebody has more money than you, if somebody has a bigger house than you, if somebody has more grand slams than you. You can't live with that feeling, no? You have to do it your way." In Nadal's case, that way now leads on to the grass, where his last appearance in the quarter-finals of Wimbledon came seven years ago. But will he play?